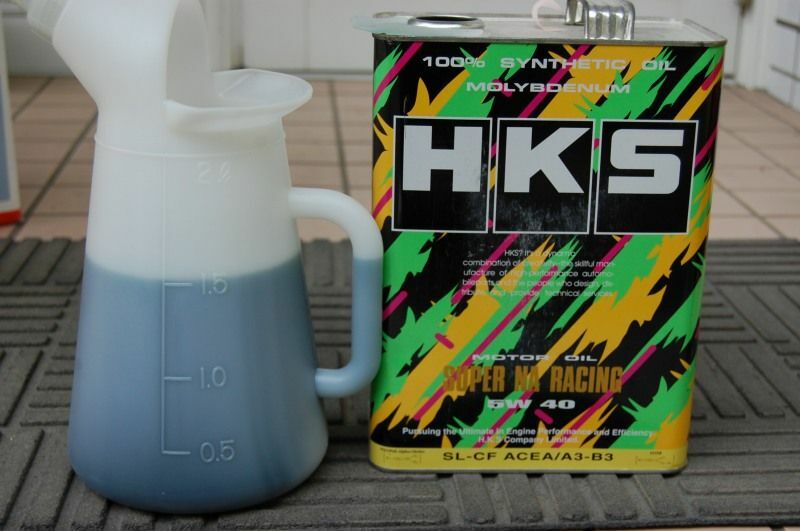 The HKS Super NA Racing Oil is designed for the lubrication of high-performance competition engines. It is fortified with superior additives and oils which resist breakdown under the high loads, temperatures and speeds experienced by fast revving engines. HKS Super NA Racing Oil is compounded to be compatible with a variety of competition fuels including gasoline, methanol, nitromethane and diesel fuels. It is recommended to be used in engines that are Naturally Aspirated. HKS Super NA Racing Oil protects cylinder walls, pistons, bearings and valve train components beyond the levels of conventional passenger car oils. Friction reducing agents incorporated into the formulation assure that maximum horsepower is obtained from the engine. Available in 4 litres. Able to penetrate piston oil line during engine operation to rduce friction thus allowing smooth engine movements. Seal up the gap between piston ring and cylinder wall. Prevent gas leakage from combustion chamber to maintain good compression. To eliminate combustion gas unburned deposit that may affect the engne performance. Remove moisture content form during combustion that create rust and corrode the engine.